The Canfield Community Concert Band is a diverse group of people with a love of making music and sharing it with the community. We are an all-volunteer band open to musicians of all ages and our members come from many communities within the Mahoning Valley and farther in Northeast Ohio. We perform many concerts throughout the year. Our calendar of events is updated frequently, so please watch for and join us at our upcoming performances. We have been invited to perform at the Sixteenth Annual Three Rivers Community Band Festival in Upper St. Clair, Pennsylvania. In addition to our performance, individual members are invited to participate in a unique Festival Band. Registration is open for the Festival Band from now until Feb 10th. See event details for complete information and please pay attention to this page for updates and logistical details as the event date approaches. 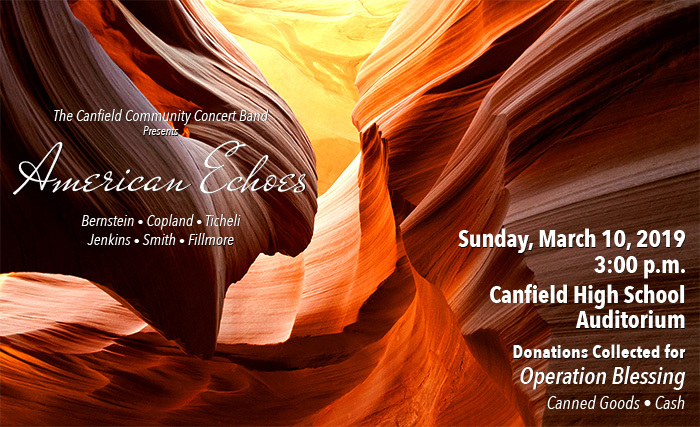 Join us at Canfield High School Auditorium for "American Echoes", a concert to benefit Operation Blessing. Donations of cash or non-perishable food will be accepted at the door.